Santa Clara Vanguard's 1984 production was an intriguing combination of the old Vanguard and the new. Despite the corps' third-place finish with a score of 97.40 at the DCI World Championship Finals, the corps was only 0.60 from winning its fifth title at the conclusion of a season that was especially exciting to follow. At the Finals, SCV tied for the high score in total visual with the Garfield Cadets, but was one point down in total general effect, which effectively decided the show for the two corps. Interesting for fans was that SCV, Blue Devils and the Cadets all tied for the high score in brass at the Finals, the only time there's been a three-way tie. 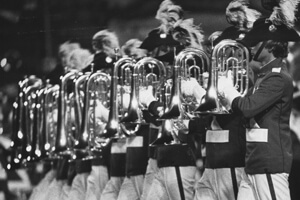 The opener to Santa Clara Vanguard's '84 production was "Fanfare and Allegro" by Clifton Williams, which the corps had played during DCI's inaugural year of 1972 and again during the corps' Championship year of 1973. Starting symmetrical to the 50-yard line at the back of the field, a flurry of 13 flags quickly spread out in a "V" formation in front, the soprano voices in the "Fanfare" segment harkened back to the wildly exposed melodic lines in much earlier SCV shows. Most intriguing in the show was the percussion feature of "Musika Bohema" by Zden?k Luk?ˇ?ˇ, a delicate piece that never had the drums even think about approaching a loud volume. Read more about this special work. Selections from Leonard Bernstein's "On the Town" were brought back with a few changes from when it was previously used in 1983. The color guard members employed pink parasols that played off the elegance of their extremely long and frilly skirts, which during this piece were at times utilized as capes. Aaron Copland's "The Tender Land" showed up for the first of two subsequent years. This arrangement of Copland's famous wide-open tonalities fulfilled corps founder/director Gail Royer's long-held belief that drum corps could bring orchestral music to the field relatively intact, a position held mutually by brass arranger Tim Salzman. 1984 Santa Clara Vanguard performance excerpt. A great moment in the history of visual design was the rotating circle of brass players that expanded from a 20-yard circumference to 33 yards over 32 counts, all the time while the center point moved over five yards. It was one of those evolutions that didn't exactly reach out and grab you by the throat, unless you realized what they were doing; and then it became one of the most stunning and challenging drill maneuvers ever seen on the field. A highlight of "The Promise of Living" segment of "The Tender Land" was a rotating eight-point star that developed out of the circle mentioned above, which like the circle, also followed a moving center pivot to the right. A haunting backfield chorale led into a rapid build into a magnificent company front that just kept coming and coming and coming toward the front stands. After the front couldn't be sustained any longer, it dissipated, along with the volume, into a gentle sigh of an ending—an exhalation of a breath of relief, over which you could hear the audience members whistling their approval. It was one of those beautiful moments that reminded us of drum corps' power to reach deep into us and set our souls resonating in dazing splendor. This week only, you can save on 1984 World Championship Audio and Video Performance Downloads on the DCI Fan Network. Buy the 1984 Santa Clara Vanguard Video Performance Download. (Available this week only for $3.99. Regular price: $4.99.) Buy the Audio Performance Download bundle of all 12 Finalists from 1984. (Available this week only for $15.99. Regular price: $19.99.) Offer ends Monday, Jan. 30 at 8:30 a.m. ET.